Is your MailStore Server archive being backed up? In the last couple of weeks I’ve come across a few customers with MailStore installations where they’ve experienced corruption of their archived data due to either a damaged disk, RAID failure or power outage for example. All of these situations are of course completely outside of MailStore’s control but they’re ones where the only practical recovery method is to rebuild from a previous backed up version of the MailStore data. Without a healthy backup, recovering the archived data from the damaged disk can quickly become a costly and sometimes impossible task. If you’re also using MailStore to delete email from your mail server to keep mailbox sizes under control, that’s likely to be the only copy of the data you’ve got, so it’s absolutely critical you’ve got some form of backup strategy in place. It may sound obvious but I think it’s probably worth reiterating- EMAIL ARCHIVING IS NOT A BACKUP! There are a few different ways to approach MailStore backup but whatever you decide, I’d recommend you try and make this a daily process. 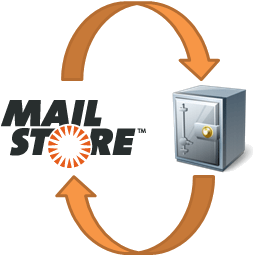 MailStore does make the process simple as it has a built-in scheduled backup feature to make a mirror of the data structure and store it to another local location. This is much better than not doing any backup at all but it’s important to be aware that this only provides you one level of protection. If you have any corrupted data in your MailStore archive, you could well end up backing this up and overwriting your last healthy backup. Also if a backup is running and there is a power cut you could again lose your one healthy backup so it’s not perfect. For a more comprehensive backup that includes “history”, you’re best off using utilising third party backup software. It’d be wrong of me not to mention BackupAssist at this point it’s the one we sell but you could of course use any file based backup solution. 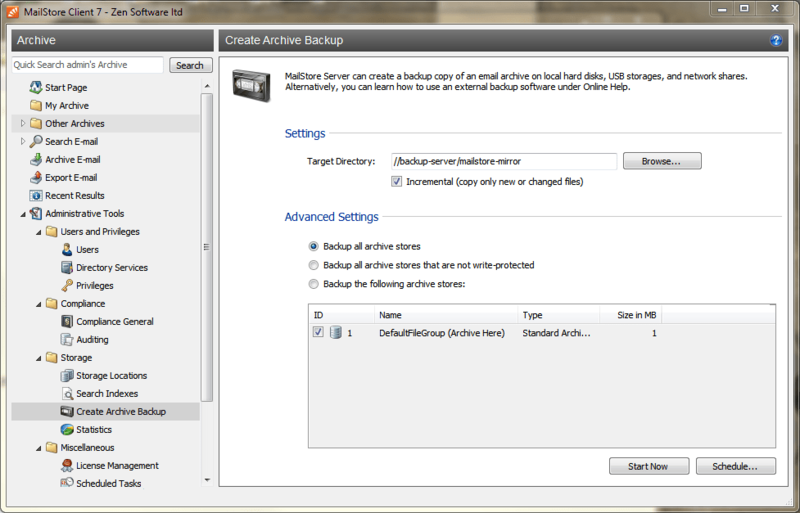 Using BackupAssist as an example though, I can quickly set up a routine to automatically create daily backups stored away from the MailStore server. Lots of our customers tend to choose to store their backups on a pool of removable backup media such as USB hard drives as these can be taken off site to provide quite a cost effective disaster recovery solution. For a fully automated off-site solution, both flavours of BackupAssist’s Rsync engine (either the plug-in to the main product or the standalone version) will provide a daily backup of the MailStore archive at a remote location while keeping at least a week history. As always, please feel free to drop me a line using the comments section below or via the contact page on our site if you’d like to discuss any aspect of your MailStore backup strategy.